Luiren, land the of the halflings, is both peaceful and bustling. Though halflings can be found in every country in Faerûn, all their ancestors originally migrated from Luiren. Sometimes known as Small Folk, halflings actually prefer the term hin, the name they call themselves. But they don't hold the use of other names against visitors who don't know any better. They're happy enough to welcome newcomers with a smile and a place to stay - though that lodging might be a half-sized stable or barn. 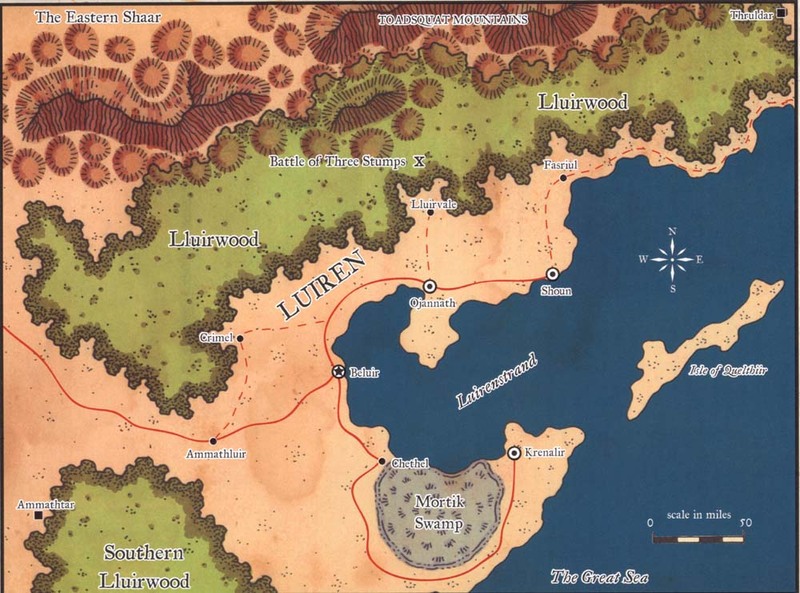 The hin nation of Luiren sits on the southern coast of Faerûn, nestled between Dambrath to the west and Estagund to the east. The settled portions of the kingdom wrap around a small bay known as the Luirenstrand, on a strip of ground between the bay and the Lluirwood that measures no more than 30 to 50 miles wide in most places. This populated region stretches generally southwest to northeast, covering approximately 275 miles from the edge of the Southern Lluirwood to the point where the Lluirwood meets the ocean, just east of Fasruil. The Lluirwood lies north of the open coastland where the major settlements are. Though ostensibly part of the kingdom, the forest is mostly untamed wilderness; and few halflings dare venture into it. The north side of the Lluirwood is bounded by the Toadsquat Mountains, and beyond those, the vast plains of the Eastern Shaar stretch away for hundreds of miles. Most of Luiren's countryside is filled with gentle, rolling hills blanketed with rich soil that supports a wide range of crops. Small copses of very large, very old trees dot this pastoral landscape. The only portion of the non-forested land that is not arable is the Mortik Swamp, which butts up against the southern coast of the Luirenstrand and divides the southern peninsula of Luiren in half. Like the rest of southern Faerûn's coastal region, Luiren is warm and humid through most of the year. Because of the Toadsquat Mountains, which catch the updrafts of humid air off the ocean and churn them into cooler, rain-filled clouds over the woodlands, Luiren gets more rain than either Dambrath to the west or Estagund to the east. The season of heaviest rain, during the winter months, slows trade and travel but is good for the growing season during the rest of the year. The green, rolling farmland that makes up most of Luiren is bounded on three sides by forest or mountains, and on the fourth by the ocean. Though the halflings enjoy the forests, they do not stray far into the woods for fear of the monsters that live there. Most of the region is rural, and the halflings grow grains, vegetables, and citrus fruits for eating or sale to merchants from other lands, Lit the quaint communities of hillside tunnel-homes that dot the open country, the hin often gather together to share produce, stories, and news from other lands. Sometimes referred to as the Long Forest by the halflings to the south, the Lluirwood stretches more than 400 miles along the north side of Luiren, covering nearly half the country. Along its whole length, citrus trees and many warm-weather evergreens form a deep, dark canopy that shelters trailing vines and a profusion of undergrowth. Where the northern side of the forest climbs up the slopes of the Toadsquats, numerous hardwood trees, especially oaks, which thrive in the cooler temperatures, replace the less hardy varieties. Though no place within the forest is safe, the eastern end is by far the more dangerous, especially in and around Thruldar. Ghostwise halflings call this area home, and they brook no intrusion into their territory. In addition to the occasional bandits, the eastern end of the Lluirwood is home to immense spiders, rhino beetles, flying snakes, stirges, and perhaps worst of all, tall mouthers. The western section of the wood serves as the expansive "temple" of Nola Treesong (NG female strongheart halfling ranger 5/druid 8 of Sheela Peryroyl), who spends her time nurturing the forest, aiding marchwardens in keeping it safe, and discouraging foolish and unprepared folk from venturing too far into its depths. The bay known as the Luirenstrand is not as calm and safe as either the Bay of Dolphins to the west or the Golden Water to the east. Its depths are noticeably darker and murkier than either of those two bodies of water, and the halflings, who are not much for sailing, spend little time on its surface. Still, the amount of trade passing in and out of Luiren means that merchant ships crisscross the Luirenstrand on a regular basis. A regularly scheduled route from Shoun to Krenalir crosses the bay in one direction every couple of days to ferry merchants and other folk between those two cities, thereby saving them several days' travel overland. The Mortik Swamp is a lowland region in southern Luiren that effectively separates the tip of the peninsula from the rest of the country. The region is so close to sea level that the ground cannot drain properly, and the excess water has formed a swamp. Mortik Swamp is a nasty bog filled with countless pests. In addition to the giant ticks that give the place its name, Mortik is also home to giant varieties of frogs, snakes, water spiders, and deadly wasps; as well as biting swarms of more mundane insects. Perhaps the most dangerous and cunning inhabitants of the swamp, however, are the merrow. These creatures occasionally raid the surrounding farms and caravans, carrying off livestock and food stores to feed their tribes. A powerful shaman or chieftain known as the Bog King (GE male merrow barbarian 7) presides over these creatures. With these creatures at his command, the Bog King can make the road between Chethel and Krenadir a dangerous route. Almost as long as this region has been inhabited, rumor has held that a hidden city lies somewhere in the middle of the swamp. To date, the persistent lack of evidence to support such claims has never stopped adventurers from trying their luck. Most of those foolhardy enough to brave the Mortik and lucky enough to return emerge with swamp fever, rashes, leech bites, and mud-covered bodies, but no fortunes to speak of. The isle of Quelthiir is little more than a wide sandbar that divides the mouth of the Luirenstrand from the rest of the Great Sea. The entire island, 100 miles long but only 10 miles wide, is made up mostly of low hills covered with sea grasses, scrub brush, and a few scattered, stunted trees. Every few years, a storm surging inland from the ocean scours the island unmercifully with rain and wind. Despite its inhospitable geography, this island is the source of many rumors. More than a few tales have hinted at buried treasure hidden on the island by pirates who once terrorized the southern coast of Faerûn. The most-often heard rumor revolves around Captain Hape "One-Eye" Belson, a notorious rake from Durpar with a cunning nature and a mean streak. According to the stories, One-Eye seized a fortune in pearls and silver from an outbound Dambrathan merchant ship that he subsequently sent to the bottom of the sea with its entire crew still on board. Thereafter, he sailed straight to Quelthiir, where he constructed a buried vault protected by all sorts of nasty tricks and traps. He supposedly hid the loot in the vault and then high-tailed it to Purl to hole up for a while, but the Dambrathans caught him and dragged him to the temple of Loviatar, along with his entire crew. His treasure, if it ever existed, must still be sitting at the bottom of that hidden vault. This untamed stretch of forest serves as an effective boundary between Luiren and Dambrath. In the formative years of Faerûn, the Lluirwood and the Southern Lluirwood comprised a single, great forest that covered present day Lluiren. This vast woodland was eventually divided into two parts by a combination of clear-cutting by the stronghearts after the Hin Ghostwars, several bouts with tree blights, and the need for a road to Delzimmer. In the years since, the Southern Lluirwood has shrunk to perhaps two-thirds of its original size, but it is still shunned by most prudent folk. A gloomy, mysterious place, the. Southern Lluirwood houses creepy, dark things that the halflings use in their ghost stories. Some of the hin (particularly marchwardens) try to patrol the periphery of the woodland, but the dangers are so real and subtle that many of them simply disappear and are never seen again. What they don't realize is that two different but very dangerous creatures roam the forest, and neither of them likes to be noticed. The first threat is a tribe of yuan-ti based in the southern regions of the Black Jungles on the Chultan Peninsula. Members of this tribe have been entering the wood for some time by means of a two-way portal and kidnapping halflings who stray too close, then transporting them back to their own city for experimentation. In addition, these woods are haunted by a tribe of beholders led by a very old and cunning beholder mage named Xianthrope (LE beholder mage 7). Xianthrope has created a number of death tyrants to destroy both hin and yuan-ti who wander into their hunting grounds. The Toadsquat Mountains form Luiren's northern border, dividing it from the Eastern Shaar to the north. This range, sometimes referred to as the Little Mountains by people in Estagund, is old and worn, and its gentle slopes are covered with trees on the south side, where it merges with the Lluirwood. If it weren't for the silver that lies in the depths of these mountains, few would pay them any attention at all. Numerous tribes of gold dwarves live in the mountains and work the silver mines they have established there. The Stout Folk divide their time between extracting the silver and battling the ogres that contest their living space. In recent years, the fighting has gotten worse, primarily because an ogre mage named Kalispar Onefang (LB male ogre mage sorcerer 7) has been organizing and inciting his followers toward more aggressive tactics against the dwarves.